The term "hockey stick" was coined by the head of National Oceanic and Atmospheric Administration's (NOAA) Geophysical Fluid Dynamics Laboratory, Jerry Mahlman, to describe the pattern of historical temperatures in the northern hemisphere (it kind of looks like a hockey stick on its side). The chart, created by Dr. Michael Mann (now at Penn State University) shows relatively stable temperatures until around 100 year ago when we see a spike up. 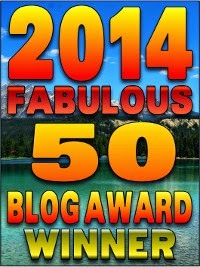 It is one of the key pieces of information used to prove that global warming is about to destroy the world. To create most of the chart, climate change scientists had to use natural sources (as opposed to someone taking the temperature with a thermometer). Tree rings and ice core samples were used to measure the temperature levels, which are standard procedure. What isn't standard procedure is the fact that the tree samples and temperatures were selected to skew the study. This Chart became the center of the IPCC's argument that man-made global warming was real. 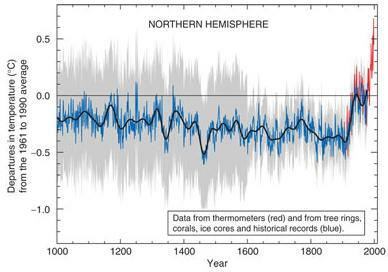 Memo's released as part of the Climategate scandal reveals that even the CRU at the University of East Anglia , had serious problems with the Hockey Stick chart, but it was pushed through by the chart's creator Dr. Mann. The British Newspaper The Guardian has published the full manuscript of its investigation into the climate science emails taken from the University of East Anglia. Those documents which revealed apparent attempts to cover up flawed data; moves to comprise the Climategate scandal, an effort by leading climate scientists, to prevent access to climate data; and to keep research from climate skeptics out of the scientific literature. One of their investigations detail the development of the famous hockey stick. .....Damagingly for the mainstreamers, the Guardian has discovered that there was a vitriolic debate within the mainstream science community in 1999, during preparation of the IPCC report, about the validity of the graph. Mann and CRU's tree-ring specialist Dr Keith Briffa are often portrayed by their enemies as co-conspirators, but the CRU emails reveal that back then they were actually in competing camps. Mann promoted his hockey stick. Briffa was very dubious, especially about the prominence the IPCC wanted to give it. The stakes were high. In the late 1990s, the heat was on to demonstrate the level of natural variability in climate change. In 1996, I visited Briffa at his lab at the CRU. He told me: "Five years ago, the climate modellers wanted nothing to do with the paleo community [scientist studying past climate]. But now they realise they need our data. We can help them define natural variability." For many years, scientists like Briffa had been analysing the annual growth rings in ancient trees. It was an arcane discipline. They knew that in hot summers, trees grew more, leaving wider and denser growth rings that could be dated by simply counting backwards from the bark. All sorts of data began to emerge. They saw thin rings in trees around the world after major volcanic eruptions, but also longer-term trends visible only by assembling and averaging different data sets from tree ring studies round the word. At the same time other analysts were producing other kinds of proxy climate data, from the size of glaciers and air bubbles trapped in ice, to the temperature imprint left in coral reefs and sediments in lakes and the temperature of water at different depths in deep boreholes. Scientists were hoping to come up with a hockey stick-like graph even before they began to assemble the data. Tim Barnett, then of the Scripps Institution of Oceanography, part of the University of California, San Diego, joined Jones to form a small group within the IPCC to mine this data for signs of global warming, ready to report in the next assessment due in 2001. "What we hope is that the current patterns of temperature change prove distinctive, quite different from the patterns of natural variability in the past," Barnett told me in 1996. Even then they were looking for a hockey stick. Up stepped Mann, then at the University of Virginia. He and colleagues Ray Bradley and Malcolm Hughes began one of the first serious attempts to work out the average global temperature over the past millennium. Most tree-ring records were from Europe and North America. So Mann's team tried to build a more global picture by including proxies of different sorts from as many different regions as possible. It was pioneering work, assembling and collating data that had never been put together before and aiming for a single graph of global temperature. They published their first graph, showing average temperatures in the northern hemisphere going back to AD 1400 in Nature in 1998. The following year the team extended the reconstruction back to AD 1000, relying on the few proxy records that go back this far. 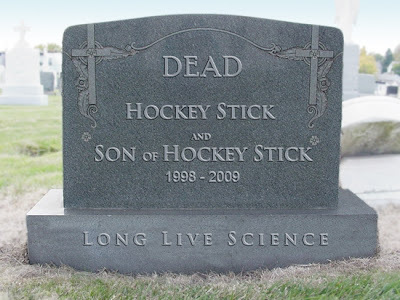 This 1999 version, published in the journal Geophysical Research Letters, was dubbed the "hockey stick" not by Mann but by Jerry Mahlman of the National Centre for Atmospheric Research in Boulder, Colorado. From the beginning the graph looked a bit strange, because the pre-1900 period should have shown a greater variance in temperature to account for natural climate change phenomena, but Mann would have no part of it. The long straight shaft of the hockey stick was a surprise. Conventional climate histories recorded a much more wavey line, with a warm period in the medieval period around AD 1000, followed by a little ice age. Mann's explanation has always been that these phenomena were largely European and North Atlantic phenomena. They were not global. Indeed it was likely that if it was warmer in some places back then, it would be cooler in others. But many tree ring researchers in particular doubted whether the graph had got it right. Initially Mann shared such concerns. The title of their 1999 paper, "Northern hemisphere temperature during the past millennium: inferences, uncertainties and limitations" was hardly bombastic. Scientists even began to find data that should have not been used, that Dr. Mann used anyway. Reconstructing past temperatures from proxy data is fraught with danger. Tree ring records, the biggest component of the hockey stick record, sometimes reflect rain or drought rather than temperature. When I investigated the continuing row surrounding the graph in 2006, Gordon Jacoby of Columbia University in New York, said: "Mann has a series from central China that we believe is more a moisture signal than a temperature signal... He included it because he had a gap. That was a mistake and it made tree-ring people angry." A large data set he used from bristlecone pines in the American west has attracted similar concern. Deciding which data sets to include in such reconstructions was, if not arbitrary, then open to dispute. And dispute there was. In the late 1990s, the researchers in heated debate about what they could and could not reliably show about past temperatures, and how to represent their findings. And they were under pressure to "deliver" for the IPCC. Then there was the miracle of the 1990's Dr. Mann made the entire decade get warmer by "snapping his fingers"
As the hockey stick began to appear in the scientific literature, it emerged that 1998 was the warmest year in Phil Jones's 150-year record of thermometer data. The length of the hockey stick blade just grew. Those in charge of publicising the work of climate scientists and making the case for man-made climate change were understandably excited. The World Meteorological Organization put the hockey stick on the cover of its 1999 report on climate change. Then IPCC chiefs decided to give it pride of place in their 2001 IPCC report. Moreover, based on the hockey stick, they stated that "it is likely that the 1990s was the warmest decade and 1998 the warmest year during the past thousand years". That attracted attention — and trouble. The doubts expressed in that paper title about "uncertainties and limitations" were melting away. That's when the arguments really started. Mann and his team wanted to present a simple story for policy makers, Briffa wanted scrupulous honesty about uncertainties contained in Mann's chart.The IPCC's core job is to present a "consensus" on the science, but in this critical case there was no easy consensus. The tensions were summed up in an email sent on 22 September 1999 by Met Office scientist Chris Folland, in which he alerted key researchers that a diagram of temperature change over the past thousand years "is a clear favourite for the policy makers' summary"
But there were two competing graphs – Mann's hockey stick and another, by Jones, Briffa and others. Mann's graph was clearly the more compelling image of man-made climate change. The other "dilutes the message rather significantly," said Folland. "We want the truth. Mike [Mann] thinks it lies nearer his result." Folland noted that "this is probably the most important issue to resolve in chapter 2 at present." Briffa believed that the world's temperature heated up about 1000 years ago as much as they seemed to in the 1990s, and was upset that Mann's chart did not reflect that climate change. Even the co-creator of Mann's paper on the hockey stick began to walk way from it. Three hours after receiving Folland's response, Briffa sent a long and passionate email demanding caution over the use of Mann's hockey stick. "It should not be taken as read that Mike's series is THE CORRECT ONE," he warned. "I know there is pressure to present a nice tidy story as regards 'apparent unprecedented warming in a thousand years or more in the proxy data', but in reality the situation is not quite so simple... For the record, I believe that the recent warmth was probably matched about 1000 years ago... and that there is strong evidence for major changes in climate over the Holocene that require explanation and that could represent part of the current or future background variability of our climate." This last point is important. Briffa was saying not only that the hockey stick might not be right, but that any graph of the last thousand years could not be taken to represent the limits of natural variability. The September spat was the last in a simmering row. Only hints appear in the published emails. But they underline the anger behind the scenes. In April 1999, Ray Bradley of the University of Massachusetts, a co-author of Mann on the hockey stick papers, was apologising for Mann's stance. "I would like to dissociate myself from Mike Mann's view...I find this notion quite absurd. I have worked with the UEA group for 20+ years and have great respect for them. As for thinking that is it 'better that nothing appear, than something unacceptable to us'... as though we are the gatekeepers of all that is acceptable in the world of paleoclimatology seems amazingly arrogant." The row concerned an article Briffa and colleague Tim Osborn were writing for Science magazine. Unfortunately that common foe was the truth. The Guardian Climate change investigation has much more to offer, I recommend you go to the site to read the full hockey stick report, as well as the other parts which chronicles how Global Warming Science became a lie. CLICK HERE for the full report. It is simply amazing to me that the leading AGW scientists (especially Mann at Penn State, hauling along with him Jones, Briffa and others at UEA and around the world) could get away with this behavior --- for so long. I always knew that scientists, like pop-artists and poets and pundits and people in general, do have their faults. But I'd always thought that the internal processes of data-sharing and replication of results and peer-review would function to correct the inevitable individual ethical failures. You'd think they would have learned from the Lysenko affair. I would be very much satisifed if this culminated in criminal indictments and the smoking finish of several professional (and political) careers. Where is Al Gore and his silly movie?